For fans of Jim Davis’ Garfield comic, comes a brand new, cross-platform trivia game featuring the classic characters. In Garfield’s Trivia Party your job is to fill out portions of a comic strip, that have been wiped away thanks to Odie’s coffee spill. Developed by Lamplighter Games, the same folks who brought you Vidburn, Garfield’s Trivia Party is a free to play, turn-based game for iOS and Android. Playing against friends or randomly selected opponents, the game starts by spinning a wheel to determine the comic strip category. Each game displays a real Garfield comic with a portion of the text blotted out and four answers to choose from. When selecting the correct answer, you score points that can be used throughout the game. By cashing in your points or buying coins through in-app purchases, you can: opt to have the game wipe out two incorrect answers, see a community poll that illustrates how others answered the question, or get a hint that will guide you in the right direction. Beyond the simple and entertaining gameplay, the schmoozy jazz music and eye-catching graphics of Garfield’s Trivia Party, make for a fun way to reminisce with your favorite gang of characters. 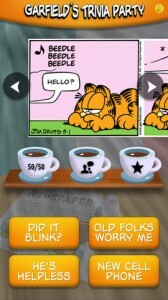 Download Garfield’s Trivia Party for free from iTunes or Google Play and test your Garfield knowledge. Garfields Trivia Party – iOS & Android from Lamplighter Games on Vimeo. The official Apple App Store Facebook page posted about this, didn’t realise it was a Corona made game. Whoa – that’s pretty neat! Good to know. This is great, especially since it works for both iOS and Android!